To all in the Workshop, need help!! I have purchased the Edmonds Windmaster 300mm roof vent from Bunnings and installed it into our cathedral ceiling roof but we now want to put a powered damper on it to close it off in winter thus eliminating having to climb up on a ladder to do it. Have contacted Edmonds directly and they don't supply powered dampers for residential use, only manual dampers. How do the manual ones work? Would there be any possibility of installing a manual one and getting an electrician to add a motor to it? 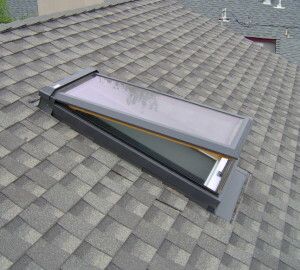 @Baretta11 Not quite sure why you would want to close off the vent as it removes moisture out of the roof space in winter. However if you want to close it, is it something like the picture below you are after? These type of dampers should be available from your local air-conditioning installer. Just make sure you get a 230V connection/motor as many of these are run on either 12 or 24V and you will need further control wiring installed. Thank you so much for your photo. It's not that I don't want or like the whirlies, they will no doubt work well in summer but to heat our indoor pool in winter, requires the room to have no air escape, something we realy didn't know. We will need to use a dehumidifyer to seperate the heat and moisture from the air in the room, return the heat into the room and return the moisture back into the pool. If there is any air escape, the cost of trying to heat the pool will be astronomical, hence, a damper on the whirlies that can be controlled is the best solution. Can you tell me anymore about the picture you supplied, is it made in Australia?? Seems that is what the picture is that the next post shows. As @Wayne always says, 'think outside the box'. I was having another think about this this morning and thought maybe you could do something like this as an alternative. It would look asthetically more pleasing than a large exposed duct. Have a look at the link and it will explain in more detail. (I am not affiliated with this company). Thats a great idea if I didn't already have the whirlies fitted on a brand new roof and I'm prety sure hubby would refuse to change them to something else, but the pic you have provided shows a very neat looking idea. We need the damper to be on the inside, in the little bit of roof cavity that exists, as it's a cathedral ceiling. A normal looking vent showing on the plaster ceiling is all that anyone will see but with the ability to be able to closeoff the internally fitted damper during winter. If it wasn't for thinking that the whirlies will be handy in summer when the pool room may get a little too hot with the solar, I'd actually close them or seal them off permanently thus solving the problem of massive hot air escape. Truth is, I never really wanted the whirlies, as I was already fairly well worded up by people in the know on how the pool needs to be to function correctly with winter heating, so as to avoild crying windows and more importantly, heat the pool efficiently but hubby was adamant the whirlies would do, so as not to have a disagreement, the whirlies went up!! I just need to find a damper that can hopefully be retrofitted but with remote control rather than a stick to open and close it, as the ceiling is not just quite high but also directly over the top of the pool, so reaching the otherwise manual method would be awkward to say the least. Thanks though for looking out for something for me, I really do appreciate the effort.